Mimicking conversation heart candy (which are in short supply this year), Krispy Kreme debuts new, limited-time Valentine Conversation Donuts. The heart-shaped donuts are available starting January 30, 2019 and feature over a dozen Valentines-themed phrases in icing on top, including "DM ME," "ALL THE FEELS," and "BE MINE." Each donut also comes with one of four fillings, including Cake Batter, Strawberries & Kreme, Raspberry, and Chocolate Kreme. 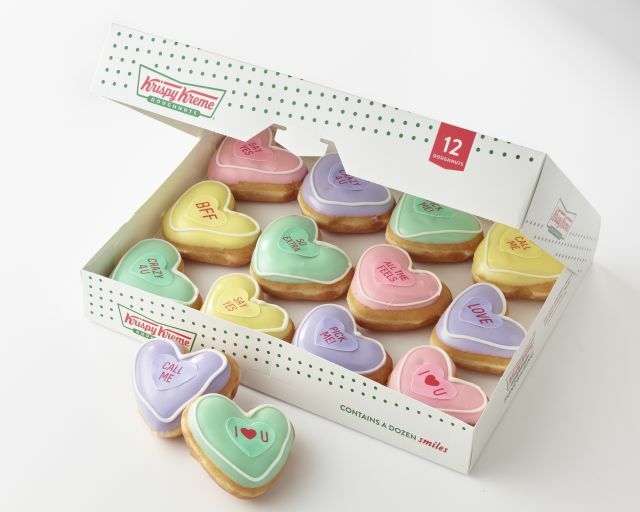 As a Valentine's bonus, Krispy Kreme Reward members can score a free Valentine Conversation Donut of their choice with any purchase on Wednesday, February 6, 2019. The festive donuts will be available through Valentine's Day, February 14, 2019 at participating location nationwide.